Maybe wear some sunglasses, just to be sure. Let's get something out of the way right now. The Trine series has been known for consistently beautiful visuals since it first graced our liquid crystal-ridden screens, and Frozenbyte has long been the master of the whimsical fantasy aesthetic. These two facts are infinite truths. Pillars of all that we know to be real. Trine 3, though? Woof, guys. Woof. I found myself pausing this gameplay video within the first minute or so just to marvel at the initial field blanketed in the evening sunset. That's to say nothing of the cave delving and shield gliding that occurs later in the video. 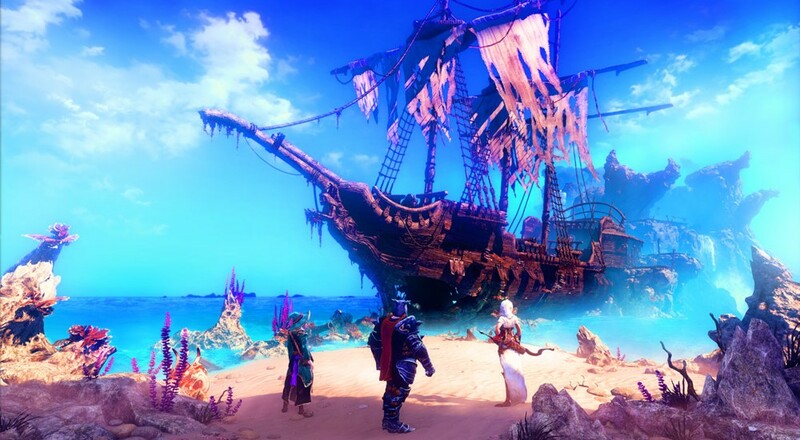 Although we aren't so lucky as to know the specific date just yet, we do know that Trine 3's three player co-op will join us in the physical realm sometime in 2015. I've gone ahead and created a shrine devoted to appeasing the Gods of Delay to make sure that this remains a reality. If you'd like, you can contribute as well. I hear that the Gods take kindly to burnt Duke Nukem Forever effigies. If you find that you don't know a great deal about the best platformer to come out of Finland, you're more than welcome to check out our reviews on the first two entries to see if the dual medias of "video games" and "both of your eyes melting from visual glory" are up your alley. The first can be found here, while it's followup is located here. Page created in 0.4695 seconds.